Ford factory-backed race team Multimatic is on a massive roll. 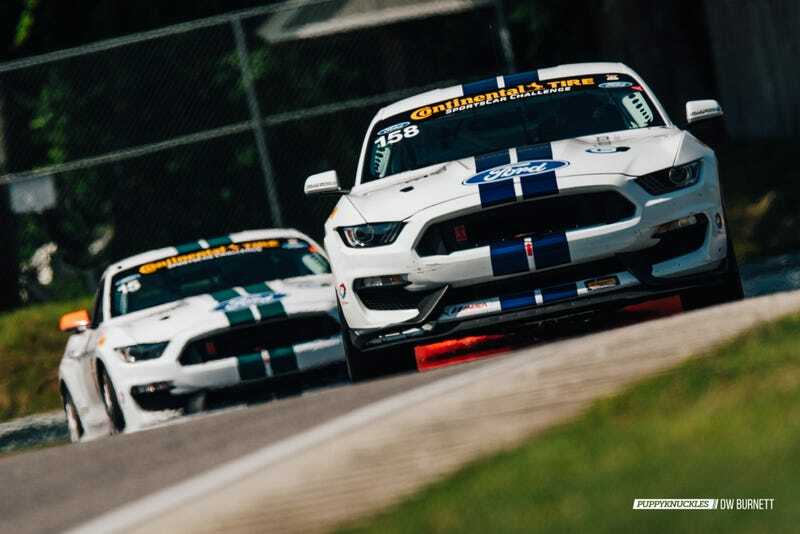 After a decisive home turf win at Canadian Tire Motorsport park two weeks ago, the team pulled into Lime Rock Park this weekend armed what would again prove to be the deadliest weapons in the Continental Challenge GS field: their pair of Ford Performance Mustang Shelby GT350R-Cs. These new Mustangs are scary fast. After Mosport they were saddled with 50 lbs. of extra ballast to try and slow them down. Didn’t work. Despite missing qualifying because of an electrical problem, Billy Johnson and Scott Maxwell drove their #15 GT350R-C from dead last to take the win at Lime Rock, with the sister #158 Mustang right on their heels. Incidentally, the team probably would have swept the front row at Mosport too, but the no. 15 GT350R-C was knocked off track during the race and destroyed. The winning #12 car they brought to Lime Rock was a “body in white” just two weeks ago, screwed together literally at the last minute. An engine specialist from Roush Yates racing - who we’ll call “Charles”, because his name was Charles - told me that they take the same 5.2 liter, flat-plane crank Voodoo V8 that is in the upcoming street GT350 and simply bolt on a dry sump oil tank before they drop it in the race car. If so, that is one hell of a motor. Still, I may have noticed a little glimmer in his eye as he spoke about it that implied there were a lot of secrets how wasn’t divulging about this new race car. One thing that isn’t a secret: the Multimatic Mustangs are straight up killing it in the Continental Challenge and earning new fans, including me. I’m a Mustang owner (who tracks his 2012 GT at Lime Rock), so it was super exciting to get up close and watch these cars dominate this race. I was definitely cheering for the GT350R-Cs from behind my lens. I’ll be watching the rest of the season, good luck guys. For the full gallery of GT350R-C goodness, head on over to the original post on puppyknuckles.com. Thanks for reading. What - you’re not all up on my Instagram or Twitter? Follow me!